For 13 years, Coffee News® has been the most affordable and effective advertising media in Polk County. 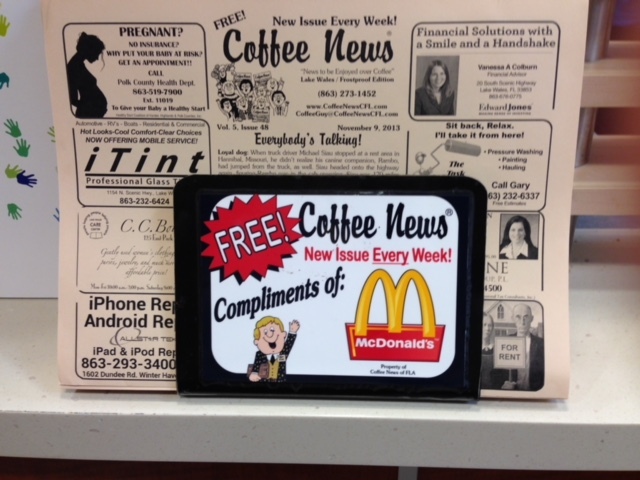 Weekly editions are found throughout Polk County in local and chain restaurants, like McDonalds, coffee shops, like Starbucks and Dunkin Donuts, and other local businesses where people have a few minutes to read entertaining news while waiting. 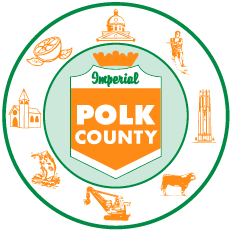 Our goal is to be “everywhere” within Polk County in order to maximize enjoyment for our readers and exposure for our local advertisers. Coffee News® began in Canada in 1988 and has brought upbeat entertainment and good news to readers world-wide while building a reputation of being a leader in local advertising. Everything in Coffee News® is designed to entertaining and upbeat. The distinctive one page publication is filled with unusual news stories, jokes, trivia, amazing facts, and a whole lot more. No bad news here! Coffee News® is one of the most potent, yet affordable, exclusive advertising publications ever produced. It has grown from a single edition, first published in Winnipeg, Canada to become the largest franchised restaurant publication in the world. With over 800 franchises worldwide, Coffee News® is now read by more than ten million people every week and is ranked in the top 500 franchises by Entrepreneur Magazine! It’s amazing and sustained growth can be attributed to its popular content, accessible distribution, unique design and format which generates results for the small and medium sized businesses who choose to advertise in Coffee News®.